Are your valuables protected? If not, why not? The typical home safe may run you anywhere from $20-$200, but the valuables you have to protect are worth far more. You may think of a home safe as an optional luxury and not as a necessity, but when the rubber hits the road, it can be one of the smartest purchase decisions you ever make. Below, you can view a comparison chart of top-rated safes. You will be able to find the type of safe you are looking for at a glance and view prices, features, reviews, and more. We recommend though that before you do, you scroll down below the chart to learn more about safes! The majority of home safes provide protection against fire and theft, and many will also protect your valuables from water damage. Certain types of safes, like gun safes, can also protect your family by keeping weapons away from children and out of the hands of criminals. A high-quality safe will not only protect irreplaceable possessions, documents, and data, but will also provide you with peace of mind. Not all safes are equal. At the lower end of the price bracket, you will find home safes which are little more than metal boxes with simplistic locks attached. 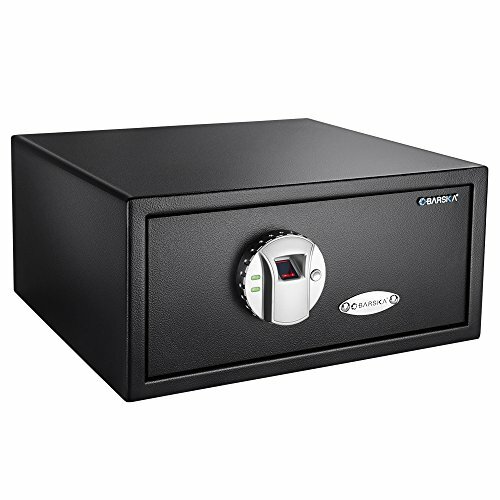 At the upper end, you will find very expensive safes that can run you hundreds or even thousands of dollars, and which offer an abundance of extra features. The best safe is not necessarily the most expensive one. The best safe for you is one that fits your specific needs. Before you buy a safe, here are some questions you should ask yourself. The first thing you may be wondering if you have never bought a safe before is, “Why do I need one?” Maybe you have a bank safe deposit box. Wouldn’t that provide you with the top level of protection? A bank safe deposit box is definitely a good form of protection to have, but it cannot provide you with everything. While you get the advantage of the 24-hour security system installed in the vault, it probably is not fireproof or waterproof. The contents in the box likely are not insured by the FDIC either. If you have a homeowner’s policy which provides you with the right kind of coverage, the contents of your home safe may actually be insured. The other reason to opt for a home safe is simple. There are some items you may need immediate access to. You may not need to have grandmother’s pearls within reach at all moments, but what about important documents or guns? These are things you want to have on hand. What Do I Need to Store? If you determine that you do indeed need a home safe, you should think next about the purpose of your home safe. This depends largely on the types of items you want to store, and what you want to protect them from. Here are a few items you may want to think about storing in your home safe. The type of safe you purchase depends largely on two factors. The first is what types of items you want to protect. This will determine the shape and size of the safe as well as some of its important features. The second main factor is what you want to protect the items from. Some safes are designed specifically for fire, others for flooding, others for burglary, and so on. Here are the major types of safes. This is one of the most common types of safes out there. A fire safe will provide your valuables with some level of fire protection, and may also protect contents from other natural disasters. Keep in mind that not all fire safes are media safes. Whether you can store media in a safe or not depends on that safe’s UL rating. Learn about UL ratings and other important features for fireproof safes in our fire safe guide. While you will not usually see a lot of safes marketed specifically as flood safes, water resistance is such an important feature to consider that it may even be your main reason for buying a safe. Be sure to check any safe you are buying for water resistance. A good rating to look for is “ETL verified waterproof.” You can learn more about water resistance ratings in our fire safe guide as well. This is a safe which has been designed to offer superior protection for sensitive electronics. Many of these boxes do not offer burglary protection. You can always purchase a small media safe to store inside a larger fire or burglary safe. Learn more about small safes. This is a type of safe which is specifically designed to keep prying hands out. It may include a more comprehensive locking system than a typical fire or flood safe. There are subsets within this category, including standalone safes, floor safes, and wall safes. Standalone safes can be placed anywhere, which is convenient, but floor safes offer the advantage of hidden installation. They also do not take up as much space. This goes for wall safes as well. Wall safes unfortunately are usually pretty poor for fire protection, and tend to be quite small. Still, they offer fast and easy access for you, while being inconspicuous and harder for intruders to discover. We have written in-depth guides on both wall safes and floor safes. Check them out to learn what is important to look for in shopping for either, and to help you decide which would be a better fit for your needs. This type of safe is specifically designed for business use, and can help you to store important documents and more. 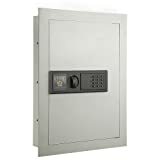 You can use a commercial drop safe for cash which does not require a combination to deposit. This is handy if you have employees using the safe for cash who should not have the combination. You can also tie this type of safe to an alarm system. Learn more about depository safes and drop boxes in our detailed guide. Need a small safe which you can stow in a drawer to store a handgun, cash, or other small valuables? 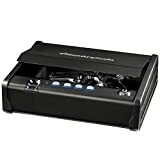 There are safes specifically built for that purpose, intuitively called “drawer safes.” Drawer safes offer excellent portability and versatility, and may be mounted if desired for added security. Learn more in our drawer safe guide. If you own guns, a gun safe is an absolute must. A gun safe keeps your guns in your hands and away from criminals. If you have children, a safe for your weapons is a necessary safety precaution for your whole family. One great thing about a gun safe is that many now function as all-in-one safes for protecting documents, data, and more. They are available with different fire-resistance ratings and security features. This makes them some of the best all-around products in the industry, which can provide you with an excellent value. Gun safes are available in a range of configurations, just like general-purpose home safes. As just mentioned, fireproof gun safes are popular products. There are also gun safes you can buy which can be mounted in your wall. Want to keep your gun handy in your bedroom? Consider a bedside or under-the-bed gun safe. You can even purchase a gun safe for your vehicle. There are a variety of locking mechanisms which may be used for gun safes, but biometric locks offer excellent convenience, security and ease-of-use. Clicking on any of the links above will take you to detailed guides on the relevant gun safe configurations. Read through them to learn about important features and considerations while shopping. In terms of pricing, gun safes can range considerably. We have put together guides to help you identify the best gun safes under $1,000 and under $500. You can also read our guide for best gun safes for the money overall. Popular brands include Cannon gun safes, Liberty gun safes, Mesa gun safes, Steelwater gun safes and Winchester gun safes. This is a type of safe which you can secure through a manual combination lock. No power source is required. Turning a dial is all you need to do to access your valuables. Learn more in our guide to combination safes. Don’t like turning a dial to try and open your safe? Mechanical locks have their advantages, but many people find them finicky. If that describes you, you may prefer a digital safe with an electronic lock. With this type of lock, you push buttons to input the code to open your safe. Discover more in our digital safe guide. If you want a safe which opens only for you and for other users you have authorized, it is hard to beat biometric technology. In this category, most home safes scan fingerprints which you have stored. These safes are an excellent choice for top-notch security as well as fast, easy access when you need it. Read our biometric safe guide. Where will I put my safe? Storing a safe in a hidden location can have advantages, but if you will regularly need to access the contents, storing the safe somewhere out of the way may tempt you not to use it. Your goal is to keep the safe convenient for you and inconvenient for burglars or children. Anchoring is a great idea, because this keeps your safe protected from burglars who discover it. Most safes include anchor holes that you can use for this purpose. It is usually wise to choose a safe that offers you a little bit more room than you think you will need. Do not just think in terms of cubic feet either. Also think in terms of height, width, and depth. Some safes include shelves as well, or allow you the option of adding or subtracting shelves. At the bottom of the price range, you will find very basic cash boxes for under $15. You can even find small gun vaults for under $25. At the upper end of the price range, you will find large rifle gun safes which allow you to store dozens of guns for more than $1,500. If you only need a really small, basic safe for a handgun or a few documents or some cash, you may very well get away with spending $25 or less. For most standard fire and gun safes, you can expect to spend $100-$300. Protection from fire is a top consideration for the vast majority of buyers. In fact, according to Greg Bonsib, the director of brand management at SentrySafe, it is the number one concern. While safes are sometimes described as being “fireproof,” this is a somewhat misleading term. No safe is truly fireproof. Safes should always be described as fire resistant. After a certain length of time and exposure, any fire safe can be compromised and its contents destroyed. When shopping for a fire safe, you will typically see a UL rating as well as detailed information on temperatures, humidity levels, and length of time that a safe can be exposed before the internal levels rise too high. The majority of fire resistant safes are specifically designed to protect paper, not media, which is a very important distinction to be aware of. If you are not planning on storing media, a standard fire safe which keeps the internal temperature less than 350 degrees Fahrenheit should be fine (paper starts to char around this temperature, well before you reach 451 degrees). But if you do need to protect media, you should be aware that temperatures between 120 and 180 degrees are already high enough to create humidity that will corrupt or destroy data. To store data, look specifically for a media/data safe, or any safe that will keep the internal temperature below 135 degrees and humidity below 85%. Some fire and burglary safes also offer water resistance. As with fire protection, this is not the same as saying the safe is waterproof. If you live in an area which is prone to flooding, it can be an important and very helpful feature. 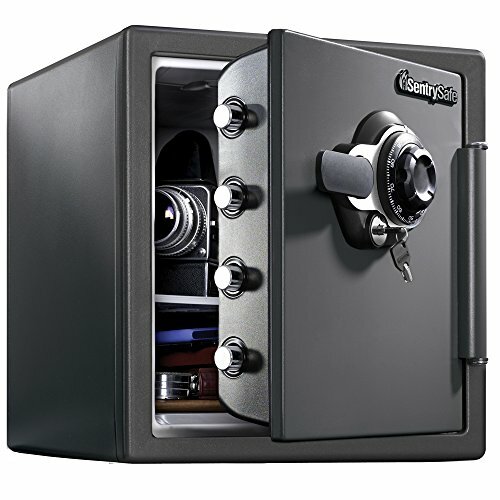 Burglary and gun safes typically offer the best protection against prying eyes and fingers. Just having a safe actually provides you with some protection, particularly if the safe is attached to your wall or floor, bolted down in some way, or heavy and unwieldy. Most burglars will just grab something unsecured and run, especially if they were not expecting to encounter a safe. If you need additional protection, pay close attention to the locking mechanism. The highest-quality locks have a UL rating and have been tested. Mechanical and electronic locks have their pros and cons; you will also see “redundant locks,” which combine features of both. Electronic locks sometimes resist EMPs and sometimes do not. Some locks also include identity scanning features. Many gun safes allow you to store fingerprints. These safes are designed to open for you and only you—and anyone else you decide to give access. Most come with a backup locking system in case the fingerprint system fails. Conversely, while you want your safe to be hard for intruders to access, you do not want to be struggling to open your safe when you are in a rush. If a burglar is down the hall and you need your gun, the last thing you need is to be fighting with a fussy lock or a jammed door. Along with intuitive, reliable locking mechanisms, safes which are designed to facilitate fast access often are equipped with spring-loaded doors which can readily pop open after you enter in your combination or scan your fingerprint. When you are shopping for a safe, you probably will be paying a lot of attention to external features: the build and materials, mounting options, the locking mechanism, and so forth. But you should not neglect the features inside the safe. Some safes include soft lining. This is ideal if you are going to be storing valuables which could easily be scratched (i.e. jewelry). Many safes also include shelving systems. These may be either set in place, or they may be removable and reconfigurable. The latter is an excellent feature if you think you may regularly change the contents of your safe. Choosing the best safe for your home is a slightly more involved process than you may have initially imagined, but with the help of our comparison chart and reviews, you can narrow down your search. Be sure to read in-depth about product features, and also check out reviews from real-life customers who have experience with the models you are looking into buying. These reviews can provide you with the insight you need to make the best choice for your home and your family. One to have a look at is the Paragon 7775. TNote that this is not a fireproof or waterproof safe; its main function is to protect against unauthorized access. Let’s look more closely at what the Paragon 7775 has to offer, and then find out what customers are saying. The Paragon 7775 includes tamper-proof hinges inside and is constructed out of solid steel. This protects the safe from burglars who attempt to penetrate it by hand or through the use of mechanical tools. The 11-gauge steel is very thick and provides impact protection. The outer frame is not as thick as the door is, but the welding job makes it very hard to break the safe open. In order to get into the safe, you need to input a three- to eight-digit code. You can change the code as often as you want. The electronic lock is powered with AA batteries. If the batteries run out or you forget the code, you can get in using either of the backup keys included. This safe includes pre-drilled holes which allow you to anchor it to the floor. The bolts are included as well. As this safe provides neither water nor fire protection, its primary purpose is to keep away prying hands and eyes. Most customers purchased it to keep out burglars or children. While the safe wouldn’t keep out a determined burglar (this is to be expected at this price point), it will keep out most children and teenagers and casual burglars who are not expecting to encounter a safe. Customers say it is easy to program and provides plenty of space, but doesn’t take up too much of it. The key is handy in case you forget the combo or the batteries die, and the construction is solid. Even without mounting it into the floor, it is pretty secure, because it would be hard for a burglar to carry it off. You can enter up to two access codes, if for some reason you want them. Some of the customers say that after a while the keypad starts to wear down. It seems like this would be a larger problem if you planned to use the safe a lot (for example, to keep your liquor away from your kids) than it would be if you only planned to access it now and again. 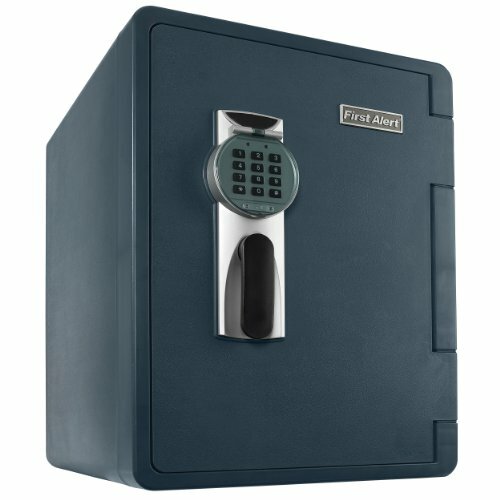 All in all, this is not the most comprehensive safe on the market, but the price is low, and if it provides what you are looking for, it is a great deal. As one customer stated, Fort Knox it is not, but it is still well worth the money. If you are looking for a small, Barska makes a great choice. It’s a reliable biometric safe ideal for storing handguns, cash, and other valuables, Barska makes a great choice. Measuring 16.5 x 7.75 x 14.5 inches, and weighing 31 pounds, this is a compact, lightweight, portable design which is still roomier than a lot of other small safes. It should fit perfectly in a larger drawer or in your wall. Mounting hardware is included, making it easy to place the safe in a spot which is both discreet and accessible. Biometric technology allows you to store up to 30 fingerprints. This saves you from the hassle of trying to remember and properly punch in a keypad combination when you are in a rush. There is a backup access system which includes two keys. A low-battery indicator alerts you with three repeating beeps and a flashing red indicator light when it is time to replace the batteries. Solid steel construction and sturdy two point dead bolts keep your possessions safe at all times. Customers report that while this is a sturdy safe, it is not made of the thickest steel in the world, and it would be susceptible to a crowbar. That said, it is still a great deterrent, especially if you have it bolted down. For thieves who just want to get in and out, or for children, it may be just what you need. There are a couple of notes that are important to remember if you buy this safe. First, you must keep holding down the initialization button while you are scanning your finger, or you will get stuck in the registration process. Second, keep a washcloth near your safe and wipe your fingerprints off the glass each time, or a clever child or thief can still get in. There is a loud “beep” emitted when you unlock the safe. Some customers dislike this, but others love it, because it alerts them if a child is trying to get into their gun safe. The safe opens quickly, so if a criminal overhears it and comes to find you, you should already have the handgun out and ready when they arrive. While the Barska Biometric Safe may not be the most compact safe out there, the roomier interior may be perfect if you want something small and portable but not too small and portable. The biometric locking system is highly secure if you use it properly, and offers you fast access when you need it. It is easy to see why this is such a popular and highly-rated safe! Looking for a waterproof safe which will also provide you with fire protection? One great option is the First Alert 2096DF. It is available in several different sizes, with or without a carrying handle. Is this the right safe for you? To find out, let’s take a look at the design features, and then check out the customer reviews. This is a UL-rated safe which has been tested to successfully withstand external temperatures of 1700 degrees Fahrenheit for up to one hour. The internal temperature will not rise above 350 degrees. This makes it ideal for protecting paper documents. While the product description says it will also protect digital data, it is wise to look for a safe with a superior UL rating for that purpose. The First Alert 2096DF is also water resistant. The seal can protect your valuables even when the safe is completely submerged. This is excellent in case of flooding, or if sprinklers in your home or office go off during a fire. Since many offices have these sprinklers, this makes it an ideal choice for business use. 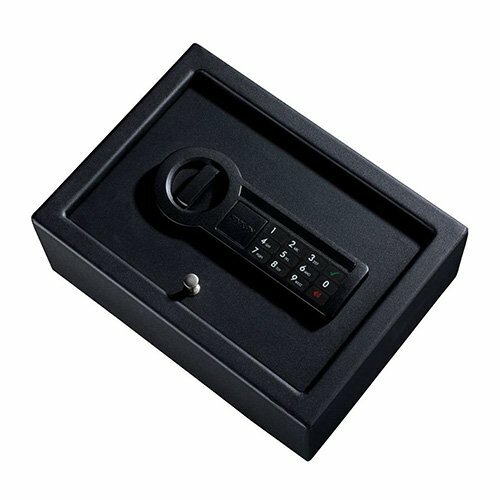 This safe includes a programmable digital lock you can operate using a keypad. You may set any three- to eight-digit code. There is also an override key if your batteries should run out or you happen to forget your access code. The safe features strong resin construction and four solid-steel locking door bolts. There are two adjustable shelves inside you can use or remove at will. The vast majority of customers who purchased the First Alert 2096DF have rated it highly. Buyers like the fact that the programmable lock is very easy to use, and say that the safe is large and heavy enough to dissuade thieves. It has a lot of excellent features, and buyers appreciate the fact that it is both waterproof and fireproof. The most common complaint about the safe concerns the instructions it comes with, and not the safe itself. The instructions included to set the personal pass code on page 5 are wrong. Thankfully, one of the customers managed to get the proper steps from customer support, and has posted them for all see. 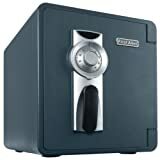 If you purchase this safe, you will want to refer to it in order to set your pass code. Once you do, you should find the safe easy to use and reprogram. The First Alert 2096DF isn’t actually all that much more expensive than many safes available in the $100-$200 range that include far fewer features. As a waterproof and fireproof safe which also includes burglary protection features, the First Alert 2096DF does it all, and for a reasonable price. Customers who are searching for a high-quality combination fire safe will want to take a look at the SentrySafe SFW123DSB. This version is the one that includes the combo lock, but there is also a version with an electronic lock which is comparably priced. Let’s check out the features and reviews! As a fire safe, the SentrySafe SFW123DSB has been certified by UL and ETL to provide up to an hour of fire protection. For whatever reason, the product description fails to mention what internal temperature the safe maintains, so this is a question you would want to ask before you purchase it. The SFW123DSB also provides you with some degree of water protection. While the safe is not entirely waterproof, it can sit in up to 8 inches of water for up to 24 hours. This safe has been subjected to impact tests as well. It has been dropped 15 feet in testing and has remained locked with the contents intact. This version of the safe includes a pry-resistant hinge bar and a dual-combination lock and key. The four 1-inch bars are 60% larger than those included in most traditional safes. A bolt-down kit comes with the SFW123DSB so that you can easily bolt it to your floor. Other features include a key rack, door pocket, and door tray you can use to store small items. There is also a shelf which you can position inside in one of several different slots. This makes it easy to customize the interior to fit whatever you need inside. 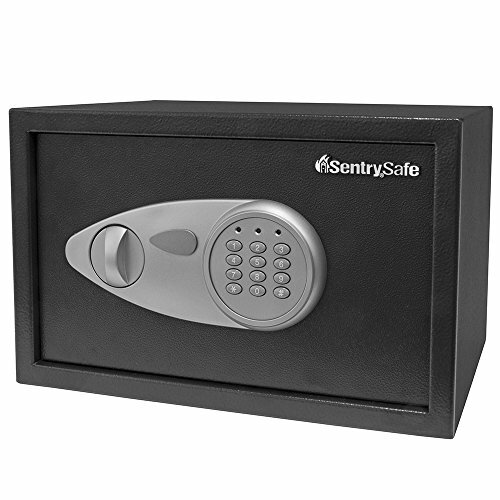 Buyers who purchased the SentrySafe SFW123DSB state that they love the sturdy construction, and that the key and combination locks are great. The safe comes with a combination already assigned, which cannot be changed, so it is vital not to lose it. You need to use both the combination and the key to get it open. While electronic locks have their advantages, a lot of people find them finicky, and prefer this more traditional setup. The interior of the safe provides plenty of space, and the door pocket and hooks are handy. The safe does not come with pre-drilled holes to mount it to the floor, so if you want to bolt it down, you actually have to void the water protection it provides. The SentrySafe SFW123DSB is not a flawless safe; the fact that drilling holes in it voids the water protection and the applicable portion of the warranty is quite silly. For all other purposes, though, it is a highly functional and useful safe. It offers a great deal of convenience and flexibility, and is the perfect choice if you want a combination lock. If you don’t, definitely check out the version with the electronic lock! If you are looking for a high-quality wall safe with excellent customer reviews, one option to consider is the SentrySafe X055. It is available in a range of different sizes. Let’s take a closer look at the SentrySafe X055, beginning with features, and then find out what customers have to say in their reviews. The X055 features an electronic lock you can program with any two- to eight-digit code. The lock requires four AA batteries. Two live-locking bolts keep your contents secure. If you need to override the electronic lock (because you forgot the security code or your batteries ran out), there are two override keys available. You should never end up locked out of your own safe. Solid steel construction makes your safe heavy (for its size) and strong, and protects it against impact damage. This is important should someone try to break into your safe by throwing it. Mounting hardware is included so you can quickly and easily self-install the safe in your wall. Using this is pretty much a must with this safe. Because it is small, it would be easy to steal if you do not bolt it down. What do buyers like about the safe? Customers praise the sturdy construction, the high-quality seal, the convenience of the simple electronic lock, and the inclusion of the handy emergency override keys (important if the battery goes dead). The fact it can be easily bolted to the wall is a huge plus too, since it is small and could easily be carried off, even with the weight. Any negatives? The knob is small and slippery according to a number of customers, which may hold you up if you need to get into the safe fast. Aside from that, there are a few customers who say the lock can be picked, but this is par the course for someone determined and a safe in this price range. This price range will give you a much sturdier safe than one costing $20, but when you pay $50-$100, you also cannot expect the Rolls Royce of safes. The SentrySafe X055 is a nice little wall safe if you want to store documents, cash, a handgun, or jewelry. Just know when you do so that a determined thief can still make off with the safe, and a determined child might still get inside. If you store it somewhere inconspicuous in your wall though, you should find it convenient, easy to use, and good for basic security purposes. It acts as a deterrent, and offers a sturdy line of defense for your belongings. If you are looking for a drawer safe by a popular brand, the Stack-On PDS-500 is a great choice. 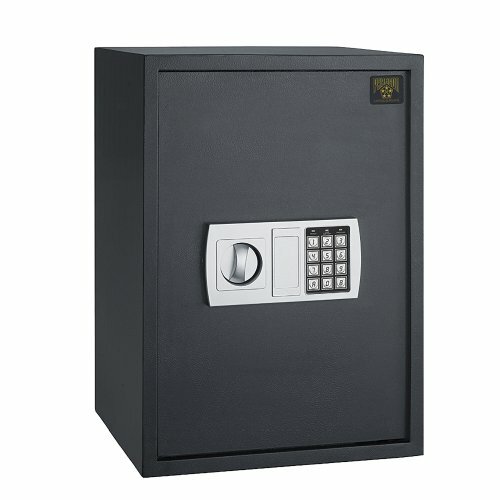 This safe is praised by customers for its sturdy design and its excellent performance. Most customers use the Stack-On PDS-500 as a gun safe; you can fit several handguns easily along with ammunition and other valuables. 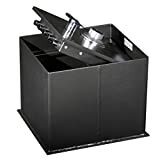 The Stack-On PDS-500 gun safe features excellent construction. Two live-action steel locking bolts operate in conjunction with concealed hinges to keep your possessions secure. You can easily mount the Stack-On PDS-500 to the bottom of a drawer using the pre-drilled mounting holes. The same mounting system works for a wall, so you have options for where you want to put the safe. The keypad requires an eight-digit code and offers you great security as well as convenience and fast access when you need it. A key override is included in case you are having difficulties with the electronic lock. A button on the side allows you to put in a new code. There is a one-minute lockout feature if you get the combination wrong. Watch out for this if you are in a rush; slow down if you have to so you do not end up locked out of the safe. It is a great deterrent though to home invaders. Nobody wants to wait a minute just to have another try to get into your safe. Customers love the sturdy build and strong materials, as well as the secure electronic lock on the Stack-On PDS-500. The safe is relatively heavy and the steel is thick. Mounting it in a drawer or on a wall is easy. The combination keypad is easy to use, and you can open the box quickly in an emergency, so it is ideal for storing a handgun. One possible vulnerability is the key hole, which can sometimes be picked using a paperclip. This is not true of all the safes; it is a defect which can only be found in some products. One customer who complained about this called Stack-On about it, and immediately was issued a replacement lock which was completely secure. This is an indication of sterling professional service from the company. This is definitely something to check if you order this safe; thankfully it should be relatively easy to fix if the matter does come up. All in all, the Stack-On PDS-500 is a sturdy and reliable choice for a gun safe or for storing cash and small valuables. Place it inside a drawer, mount it on your wall, or store it inside a larger gun safe or fire safe. It is heavy to deter thieves, offers great security through the electronic locking mechanism, and is easy to open quickly in an emergency.